Welcome to winter in Michigan! What was billed as the “Polar Vortex” (that recently spread across the nation) really felt more like a Polar Explosion here! The temperature dropped to below zero, but with wind chill, it sometimes hovered WAY below zero ….. as in 36 to 40 degrees below! And talk about snow accumulation! 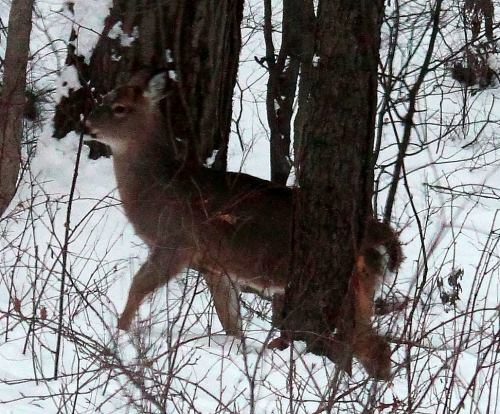 I spent a lot of time during the coldest vortex days trying to keep the birds, squirrels, and deer well fed. As a rule, I generally collect bags full of fallen acorns from the woods for that purpose. Some of the acorns are used for making dyes for spinning wool, but most of them are put in the freezer and kept for extremely cold weather (which we certainly had!) and then placed in sheltered areas for the squirrels and deer to nibble on. I also set out corn and birdseed to help all my critter buddies through the winter. This year I was surprised to see that the Robins had not headed south for the winter as expected, but were perched among the trees waiting for lunch just like my usual snowbirds. So, I put an additional supply of mealworms in the feeders for them since they have a preference for worms as a main course. And that brought another surprise: a family of Bluebirds (who also love mealworms) moved in as well. 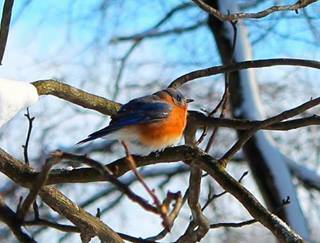 This entry was posted in Uncategorized and tagged Bluebirds, Mchigan, Michiana, Robins, Winter. Bookmark the permalink.